Board certified in Internal Medicine and Gastroenterology by the American Osteopathic Board of Internal Medicine, Dr. Preeti Jhawar has been practicing since 2013. She received her medical degree at Kansas City University of Medicine and Biosciences’ College of Medicine in 2007. 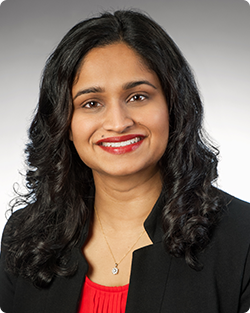 In 2010, Dr. Jhawar completed her internship and residency in Internal Medicine at St. John Macomb Hospital in Warren, Michigan, and subsequently pursued a fellowship in Gastroenterology at Botsford Hospital in Farmington Hills, Michigan. Prior to joining North Shore Gastroenterology, Dr. Jhawar served as a Gastroenterology physician at HSHS Medical Group in Springfield, Illinois. In addition, she has served on various academic and medical committees and has participated in several research studies. Dr. Jhawar is also a member of the American Osteopathic Organization (AOA), the American Association of Physicians of Indian Origin (AAPI), the American College of Osteopathic Internists (ACOI), the American College of Gastroenterology (ACG), the American Gastroenterological Association (AGA), and the Illinois Indian American Medical Association (IIAMA). Fluent in English and Hindi and conversational in Spanish, Dr. Jhawar is an avid traveler who enjoys working with children as a former camp counselor and advisor and taking an active leadership role in her academic, cultural and social communities. For several years now, she has served as a volunteer physician, giving public health talks for IIAMA and HSHS.